Capacity vs Size for Concealed Carry: which is better and why? Of the many things to consider when choosing a firearm, this is easily the most important. The choice itself should be based on what your needs are based on location, environment as well as physical and mental ability. Because you are reading this article the assumption is you want to carry for defense of self. So let us look at the various decisions and some evidence that will support your decisions in this area. I do want to make it clear that I have preferences, and I live in a hot climate. I believe you can and should carry as much ammunition as you can when you can. And when you cannot, carry what you can and know how to use it well! Location, where you live is very important to what you carry. For instance, my area of residence is on the Southern border of the United States, we have regular cartel, gang, and dog pack activity. I have personally deterred bums, gangs, and dog packs and firmly suggest avoiding any interaction with drugs as this is basically the only way you will ever interact with cartels. I was 11 or 12 the first time a feral dog pack showed up where we lived. They killed many of our chickens and attempted to attack our donkeys and the kids in the area. We hunted and killed a few dogs, maybe a dozen or so before the rest disappeared. I learned a very valuable lesson that year, never be underarmed or unarmed. Now, according to reported official data dog packs are actually a very small concern. I would, of course, remind you that country folk, rarely report things at the same frequency, or for remotely similar reasons as those in urban settings may do. As for gangs, bums and similar malcontents the idea is to simply not interact, in most situations, they will simply disappear into the rear-view with all the trash. What this means with regards to capacity and size playing a factor is, more is better when you live where threats exist and no real backup is available. Does this mean less is okay for urban areas where backup may be mere minutes away? The environment is not the same as location, it is defined as circumstances, objects or conditions that exist where you are. For the purposes of the article, one’s environment includes where you work, live and associate with others. Urban areas will have more criminal activity than rural areas, this is a mathematical reality. Violent criminals exist in a statistically estimable quantity. Per real numbers gathered through reported available data as of 2013, persistent violent offenders commit 63% of the crime, these offenders account for 1% of the total population. (Falk, Et al, 2013) Several other studies show percentages up to 7% committing the overwhelming majority of violent crimes. The industry standard for law enforcement is that 3% of the population commits 97% of the crime, while this is not reflective of violent crime, it does lend credibility to the idea that not everyone desires to or is capable of committing violent crimes. Of course, the argument surrounding the above real data and facts are often conflated to target gun owners or illegal immigrants when the reality is in many cases these groupings are less likely to commit crimes than other groups or fall within standard norms for all groupings. There is a real need to avoid categorizing people when using data like this. For instance, white males are no more or less statistically likely to commit murder than any other grouping, they are, however, in some areas numerically more prevalent which results in higher numbers of white males aged 30-40 committing more mass/serial murders. This fact of life and social groupings with ethnically differing locations of preference leads to the mistaken idea that some groups are more or less likely to commit certain crime types. What does any of this have to do with capacity versus the size of the firearm for concealed carry? Regardless of my home location if someone breaks my door in or attacks me on the street, no matter who or what, I will defend myself to the best of my abilities. Capacity is essential for self-defense purposes. It is also important to understand the needs you have prior to purchasing a firearm for self – defense. How does our physical and mental ability affect the size of the firearm or capacity of rounds it can hold? As a physically disabled individual (grade V spondylolisthesis) weight is of the utmost importance. I am also short and fat, losing weight happily, however, still fat. These conditions limit my ability to carry a number of things. For instance, I cannot carry a full tactical load-out any longer. My choices are directly affected by physical ability as well as my environment and location. This is why I have chosen the Glock 19 gen 3 or gen 5 as my primary concealed carry handgun (please, read my article on the Glock 19 here). 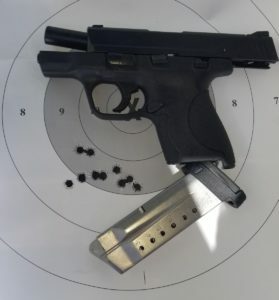 The Smith and Wesson shield 9 is my secondary carry handgun (please, read my article on the Smith and Wesson Shield here). I will be going over some solid carry options and the pluses and minuses for each in the next few paragraphs. While the Glock 19 offers a larger capacity it is still a heavy firearm as well as being somewhat larger than many other firearms marketed for concealed carry. I am using these handguns as they are close to similar models in size, weight, and capacity. In comparison, the Shield 9 is approximately 24 ounces loaded, while the Glock 19 is 29 ounces loaded. This is assuming the magazine sizes are typical as issued and not lower capacity that some of the more restrictive locations require. 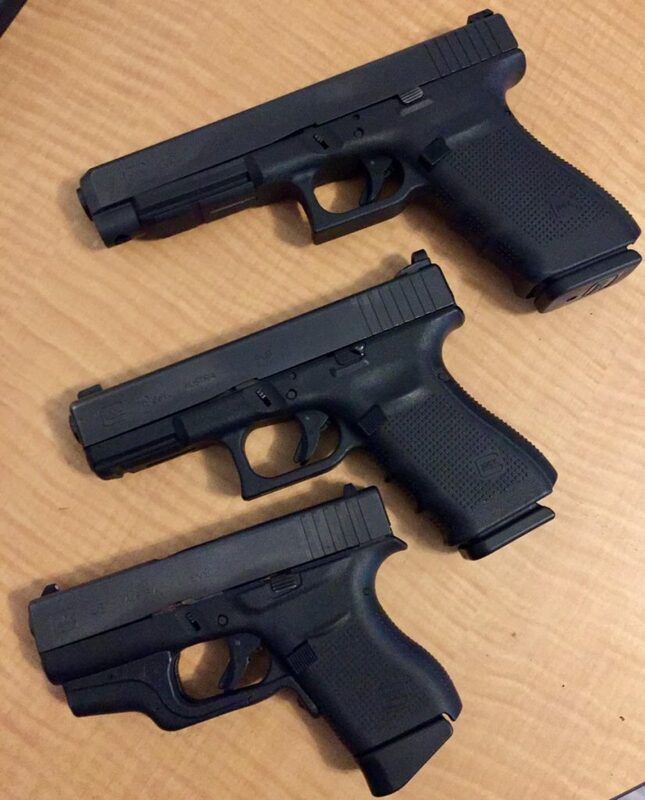 The Glock 19 comes with 2-3 15 round magazines and can fit up through 33 round magazines as needed or legally allowed. 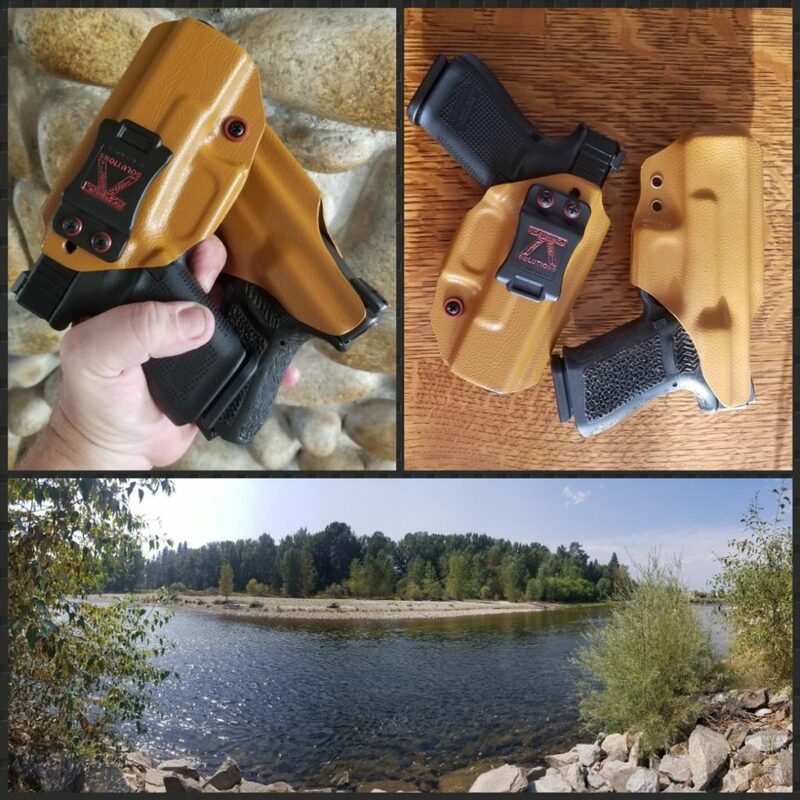 The Shield 9 comes with an 8 round magazine and a 7 round magazine. For small concealed handguns there is a reduced capacity. When you start using .380 ACP and smaller for defensive rounds you will find they generally have under a 10 round capacity. While this is not necessarily negligible overall, especially if you practice regularly and have extensive training, it is an obstacle if you do not practice quite a bit. Unlike bicycles, handguns require regular training and extensive practice to maintain a high level of success. There are several other handguns I would personally recommend based in extensive testing and real-world results. However, I will leave that to you and whomever you may be going to for advice in this area. Instead, I am going to list the questions you must ask before buying a firearm and also what you must do before settling on a firearm for self-defense. To maintain a solid level of skill, I will need to practice regularly, how much can I afford monthly? What is legal where I live, for me to carry? These are some of the questions you will want to ask yourself. You will notice I did not ask what looks best or is most comfortable, these are not relevant questions when enhancing your own “safe space”. What is most reliable, this is not a subjective question. It is a very cut and dry question, brand new from the box which handguns are most reliable. Which handguns can be used straight out of the box, without additions or changes, for self-defense? Again, this can be answered clearly with very little thought by most individuals who have carried professionally and relied on their firearms at some point. How much can I afford? This includes regular practice as well as the initial firearm practice that should include a magazine (at a minimum) of your chosen defensive load each time you go out as well. To make sure your chosen defensive load works in the firearm, initially shoot 250-500 rounds flawlessly through your handgun! The 500-1000 is for firearm reliability, the 250-500 of defensive ammunition is to ensure that that ammunition is 99% reliable as well. With solid basics and regular dry fire practice, you can easily maintain your skills with 50-100 rounds a month in focused practice. However, this requires focused attention and solid practical training. Easily the 9×19 or 9mm Luger cartridge is the least expensive overall. Less than half the cost per round of the .45acp and a few cents less than .40sw this round is the least expensive and has the numerical advantage when it comes to loads that are available. Just from today alone using AmmoSeek.com the least expensive non-defensive .45acp round is 20.3 cents a round, while .40sw is 18.2 cents a round and 9mm is 13.2 cents a round for the least expensive loadings available from the factory. You can reload, however, reloading is a skill-based approach and requires absolute adherence to safety guidelines and rigorous QC of your handiwork. I have reloaded tens of thousands of rounds over the many years I have been shooting. I have used LEE hand loaders and presses through my favorite setup a Dillon 550 or the better 650. I can say that unless you are willing to invest time in learning how to load and what works best in your firearm, location and with local climate reloading is like having a homestead; it sounds good on paper but is a lot of work and most who start tend to stop quickly. What is legal to carry? Where you live it may not be legal to carry military calibers, Mexico and many South and Central American countries allow firearms to be owned, just not in military calibers. This means that for many of their choices will not include 9×19 or .40sw. In the United States, individual state law restricts magazine capacity and sometimes firearm type based on politically motivated bias. These are all things to consider when choosing a handgun for self-defense purposes. Make sure you know the laws. It is important to note that a larger round and higher capacity does not make up for a lack of training, it will allow for more mistakes, though again this does not mean you should not train regularly. I would suggest more training for higher calibers as they have a higher recoil impact and this will affect your sight picture or aim. Understanding your skill set is essential to being able to choose a firearm that fits you best! Locate a good firearm range and go out to it on Tuesday through Thursday, weekdays are when the serious reloading/ rifle building/ shooters hit the local ranges. Weekender traffic is light and you can nicely strike up a conversation and usually within a short period of time can ask one or more to help you asses your skill level. These individuals are invaluable additions to your circle and regardless of personal beliefs or political motivation can contribute much to your evolving desire to defend yourself. An alternative to this approach is attending a local IPSC/steel challenge match and being willing to take advice. The individuals running the match are usually quite nice and want to see new people shooting and competing, be nice and ask for help. They can set up a qualifier for you and this will also help assess your practical knowledge and ability. Next, there is this approach to assessing your skill set. Have you shot a firearm before? Where have you gathered your knowledge of firearms? If you have not shot a firearm before, you are a beginner. If you have only basic military training and NO rounds fired in the field (action) you are a beginner. If you have basic military or basic NRA or fresh out of academy training with no action you are getting closer to intermediate levels. Add on practice and regular additional training and use and your skill set quickly rises. I have carried 10mm and shot .500sw accurately and well, I would not suggest these rounds unless you have several years of experience shooting and not just on a static range. Contrary to what most people say I do not believe that bigger is better unless your skill set matches your ability with the bigger side. How does any of this answer the capacity versus size debate? Honestly, it all does. Because carrying a firearm for defensive purposes as a civilian or in any other manner is a legally constricting decision that will mean you are absolutely more culpable than a non-carrying civilian or other simply because you have what is known in legal circles as a higher standard of care. The short answer to the question posed is, what do you need and are you willing to get training concealed carrier including but not limited to, basic medical care, intermediate and advanced shooting (not competition style or active combat) and legalities as well? Falk, O., Wallinius, M., Lundström, S., Frisell, T., Anckarsäter, H., & Kerekes, N. (2013). The 1% of the population accountable for 63% of all violent crime convictions. Social psychiatry and psychiatric epidemiology, 49(4), 559-71. If the weight of your carry piece is a significant concern for you due to disability or weakness, then seriously consider all copper premium ammunition for your carry gun. The difference in a all-copper load out and a traditional lead/copper assembly load out can be significant – and that is becomes increasingly true the more rounds your gun carries. I have a titanium J-frame S&W that is very light – and the difference in 6 rounds of lead ammo versus all copper ammo is very perceptible. If you are carrying 10 or more rounds the difference is quite startling. Give it a try. The all-copper ammo is in the expensive side, so I would recommend doing most of your practice with regular ammo – but for everyday carry – the all-copper ammo can make a real difference. Gray, that is a solid idea. Unfortunately i need more penetration than what is offered with copper specialty rounds. I test all carry ammunition using hogs/javelina and generally run 250 rounds at a minimum through my carry handguns before carrying. Any suggestions for all copper rounds? I am definitely open to trying them. HELLO from a WET SEATTLE afternoon! MY self I carry a older SPRINGFILD SUBCOMPACK V10 in 45ACP IT stays in my PURCE ! AND no one thinks to look there ‘YAHOO” What I have it loaded is 230 Grain Hollow Point MY son reload for me ! Capacity is essential for self-defense purposes. You lost me at that comment. Accuracy is the most important thing for self protection. it has been shown again and again since you want to use LEO and government statistics that you will only need to fire 2-4 shots in a self defense situation so hitting what you aim at is the NUMBER ONE object, period. It does you no good to have a gun with a 15-17 round capacity if you can’t hit anything. Poor man, please read entire article. The initial argument is capacity versus size- I am absolutely clear regarding accuracy and reliability. Thanks for your feedback. Poor man, in addition the statistics you refer to do not show anything other than death caused by and number of rounds. The reality is most cops and soldiers expend in excess of a magazine for stops counted- average round count per termination for modern soldiers is well over 120 rounds, while for modern usa trained police it is *using NYC alone* 28% hit rate, 360 rounds expended with 13 stops – do the math. Please understand, I have real world experience and do not frequent silly forums and idiot filled social media. Sorry if you took offence at my comment. While military and LEO may use much more ammo they are both required to advance into a problem situation not retreat from it. 99% of people that will read this post are NOT either of those and should be more concerned with getting out of a situation ( or not getting into it ) rather than resolving it. I know who you are or at least who you claim to be ( not meant as an insult) and what your qualifications are as I have read posts from you many times. You were a standard poster on another web site that I left because it was full of armchair warriors and posers ( along with a few good people ) and had become a blatant promo site for the owner to hawk his products or at least that is my opinion. I still stand by my statement. Also you are not the only one with “real world experience ” I just don’t feel the need to put myself out there. poorman, 2012 is when I stopped posting on all forums, except for rimfire where I remained until 2015 to sell off a large collection of collectible 22lr handguns.